ALAMEDA, Calif. – Oakland receiver Michael Crabtree and Denver cornerback Aqib Talib have been suspended two games each without pay for fighting. NFL Vice President of Football Operations Jon Runyan announced the suspensions on Monday, a day after the two players brawled during Oakland’s 21-14 victory. Both players can appeal the suspensions. The fight was a continuation of a dispute that started last season when Talib ripped Crabtree’s chain off during the season finale. Crabtree missed the first game between the teams this year but went after Talib early in this latest game. On the second play of Oakland’s second drive, Crabtree aggressively blocked Talib on a running play and drove him to the ground on the Broncos sideline. 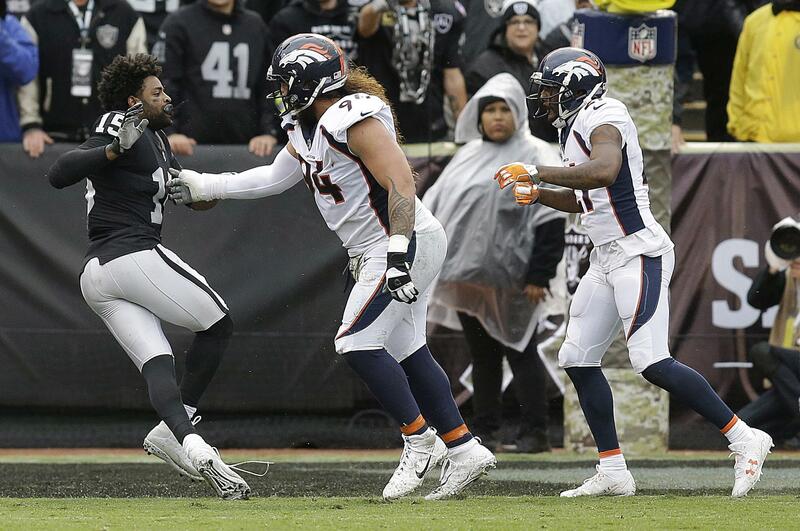 Talib ripped Crabtree’s chain off his neck while they were tangled up, and a brawl ensued. Published: Nov. 27, 2017, 8:31 p.m.